Every weekday, Ethos brings hot, nutritious meals to thousands of home bound elderly residents in Boston. 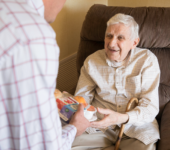 Along with a well-balanced meal, our Meals on Wheels drivers serve up a cheerful, consistent presence while also keeping a watchful eye over each recipient’s health and safety. The Ethos Meals on Wheels Program caters to many tastes, with menus that feature, Kosher, Caribbean, Asian, Vietnamese, Italian, African American, vegetarian and therapeutic dishes as well as traditional American fare. Based on their individual needs, elders may also receive frozen weekend meals, cold meals, and nutritional supplements. If you or someone you know is unable to shop for and prepare food that meets the requirements of good daily nutrition, Ethos will deliver tasty, nourishing meals right to the door. Adequate nutrition is necessary for health, functionality and the ability to remain independent. adequate nutrition even when family support, mobility and resources are lacking. For many seniors, the trusted Meals on Wheels volunteer or staff member who shows up every day with a hot meal and a warm smile is the only person they see or speak with all day. This special delivery is the reason to get up in the morning, something to look forward to, and a reminder to take good care of themselves. in the case of an emergency or problem, medics will be called, families will be notified and our seniors will not be forgotten. The Boston Elder Nutrition Program at Ethos also offers additional services that further support the quality of life and independence of our clients. We offer meals to meet special dietary needs, cultural or ethnic preferences. We also provide emergency meals for bad weather days.